Early identification of Autism Spectrum Disorders (ASD) has the potential to elicit effective early intervention, improving children’s level of functioning and developmental trajectories as well as reducing parental stress. Multiple sources of information, including several informants may facilitate early identification. This study examined the agreement between parents and day-care professionals on how they retrospectively recall early symptoms associated with ASD. In this study, we found fair to excellent agreement on early symptoms between parents and day-care professionals. 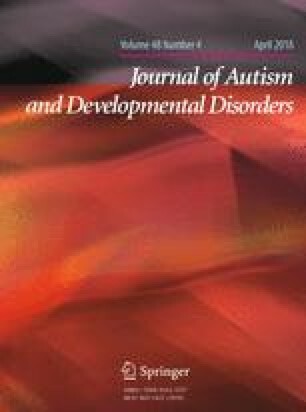 The finding indicates that day-care centres may be a supplementary area for early identification of ASD. More research is needed to explore day-care centers possible role in this early identification. The online version of this article (doi: 10.1007/s10803-017-3355-2) contains supplementary material, which is available to authorized users. This study was funded by Oslo University Hospital, Regional resource center for autism, ADHD, Tourette’s syndrome and narcolepsy. All authors contribued in planning, writing and revising the manuscript. All procedures performed in studies involving human participants were in accordance with the ethical standards of the Regional Committee for Medical and Health Research Ethics, ref.no 2013/2101and with the 1964 Helsinki declaration and its later amendments.